While imagery of Moab pops into mind when talking about Utah bike trails, Gooseberry Mesa is another amazing gem in the Utah mountain biking world. The surrounding area, near St. George in southwestern Utah, is filled with singletrack and slickrock trails. With Zion National Park as the backdrop, high quality trails weave along the mesa cliffs of both Gooseberry Mesa or Little Creek Mesa at about 5,000 feet above sea level. Much of the riding is technical and challenging - more so on Gooseberry - but, there are several different loop options for all levels of riding. From 20+ mile loops to short slickrock practice loops, most riders will find something they love. Also, the nearby JEM Trail, which starts below Gooseberry and drops down to the town of Hurricane, can be shuttled or ridden as an out and back. In the above picture, Gooseberry Mesa is on the left, Little Creek in the rear right, and the top of JEM trail in the lower right. 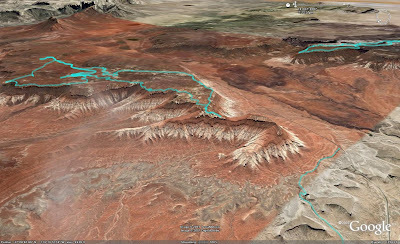 For GPS users, here's a GPX File (right click to save) that includes Gooseberry Mesa Trails, a shorter 10 mile version of Little Creek, and the beggining of JEM Trail. For more information and guided tours, check out Rim Tours.